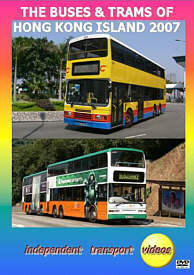 independent transport videos welcome you to this 2007 update visit to Hong Kong Island. This programme features the buses and trams of this fascinating island. We start our visit at the Central Bus Station which is situated by the new Central Terminal of the Star Ferry with plenty of action from the main bus companies that serve the island, New World First Bus and Citybus. Both companies are now under common ownership, but retain separate livery identities, but now have a common fleet numbering system. Buses from Kowloon Motor Bus, KMB, also operate many services from the ‘mainland’ on to the island. Filming moves to Connaught Road and then to busy Queensway, where we capture the late afternoon operations through into early evening. Staying in the Central area we also film along Des Voeux Road capturing the trams as well as the buses up to the Macau Ferry Terminal bus station. Kings Road at North Point is also a good spot to see the buses and trams operating side by side, and this visit was no exception. Although not on Hong Kong island, we move our location to the very busy bus station at the Hong Kong International Airport – Chek Lap Kok. The airport is situated on reclaimed land on Lantau Island. All the airbus services run through here. Citybus ‘Cityflyers’ are in evidence as well as the orange and white buses from the Long Win Bus Company, a subsidiary of KMB. Again, plenty of action for you to enjoy. You might like to see our ‘Buses & Trams of Kowloon and the New Territories’ programme, an ideal partner to this one to make your viewing complete. Duration : 91 minutes (approx).